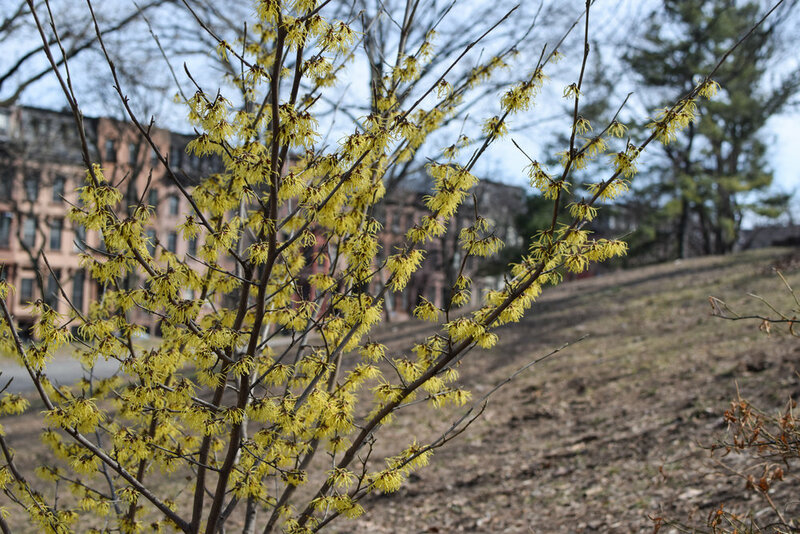 Adopting a plant helps Fort Greene Park stay beautiful and maintains our slopes. Once the plants have been added to the landscape, we’ll send you a photo! Witch Hazel is a deciduous shrub known for its brilliant yellow to rich orange flowers and its explosive mode of seed dispersal. To avoid competition with other pollinators, Witch Hazel blooms in late fall and early winter, brightening the otherwise bleak winter landscape. If your timing is right, you might just hear a loud popping as the Witch Hazel’s seed pods explode! We will plant our new shrubs at the Willoughby entrance and around the outside of the tennis courts. These 4 to 6-foot shrubs are found in many areas of the park and will be planted near the Myrtle Avenu playground. With broad leaves shaped like oak leaves, these shrubs have flowers that range from white to pink to purple that bloom throughout the summer. Blooming in late winter and early spring, Hellebore’s remind us that winter won’t last forever while helping with erosion control as all the snow melts. These showy plants are not native to this region, but they thrive in our climate. You’ll find them at the Willoughby, South Portland, and DeKalb and Washington entrances. With their beautiful, star-shaped flower heads, Asters thrive in the dry, sandy soils common to Fort Greene Park. With a bloom season that extends well into the fall, the brilliant colors of these native perennials attract an array of insects and butterflies including migrating Monarchs, making Asters an excellent choice for sunny pollinator gardens like those near the Visitor Center, the Willoughby entrance, and in the Dekalb landscape. In the winter, their seed heads provide a food source for birds. Interested in becoming a sustaining member of the Fort Greene Park Conservancy? Check out our Membership page.